Newest Stuffie | Can I Bring the Dog? ← Lions and tigers and bears – oh my! Every once in a while I find a cute stuffed dog in the children’s section of a thrift shop and buy it for Chico to play with. When we traveled two years ago, we had the first Stuffie and Chico would carry it in and out of hotel rooms while I carried my bags. Now we have another. And this morning Chico wouldn’t give it up prior to a walk, and he wouldn’t take it up the road, only up the long driveway behind the house. And he took it all the way. Up and back. 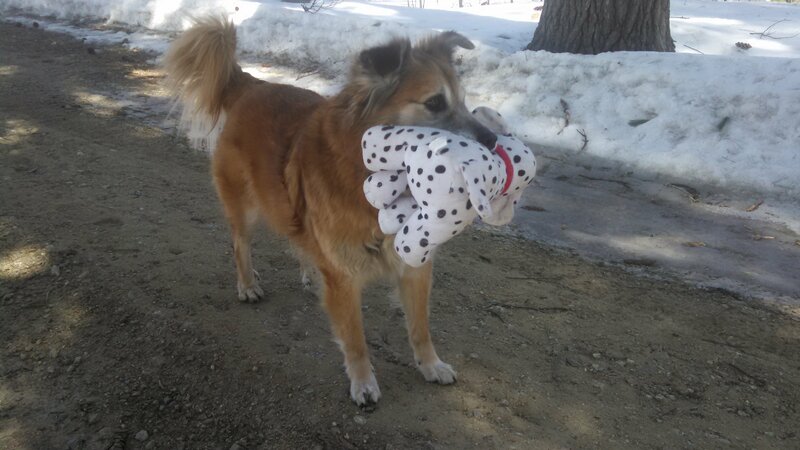 This entry was posted in Uncategorized and tagged dog toy. Bookmark the permalink.